Hi! Love this mod but I just finished a total mod overhault with The Phoenix flavor and my game will not start with this mod installed and checked. I have tried it with Vanilla too, and it still won't load. Any idea what could be wrong? Did you figure out what was causing the issue? Maybe a bad install? I was able to summon a flame atronach. but the unicorn spell isn't working for some reason. 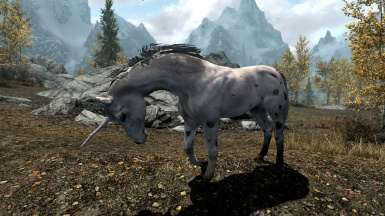 Same here, I can summon any other atronach but,not the unicorn! Currently unable to try this out, so I just wanted to ask: Does this summon tie up a slot for your conjurations, or does the unicorn become a permanent fixture once summoned? It takes up a slot but there's no point in having it summoned during combat anyway -- it runs from the fight. So you summon it to ride, you ride it, a fight starts, you either (1) stay on the unicorn and use weapons since there is no mounted magic or (2) get off the unicorn and it probably disappears immediately since the summon time has probably ended, but otherwise it runs away and disappears when you summon something else...then you summon it again once combat ends. Someone mentioned further down that it does not work with Convenient Horses. I don't know about the other ones though. 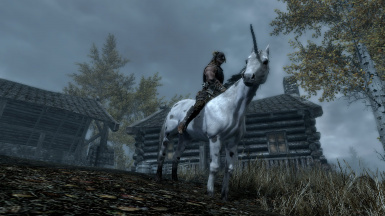 Thank you for this mod, the Unicorn has become my character's go-to mount summon. 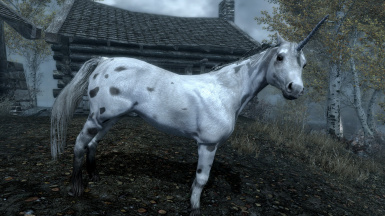 I like Arvak but I've always been reluctant to summon an obviously undead horse in front of the local necromancy-hating Nords. 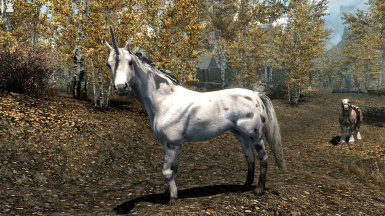 Out of curiosity, why did you give the unicorn spots when the in-lore unicorns are pure white? I found out that's supposed to be a "false" unicorn, it's just wearing a helmet, but I liked the spots so I kept them. 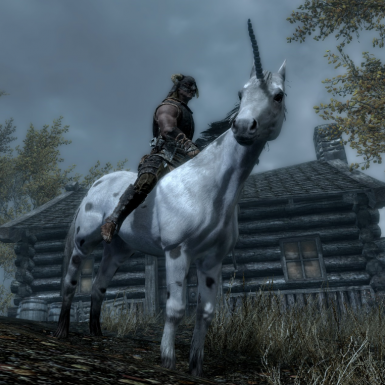 To be clear though, I don't think the lore ever specifies the color of a unicorn. 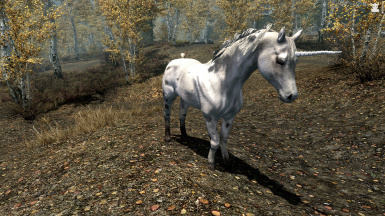 That's just how the one unicorn in Oblivion was depicted. Consider trolls. In ESO, they are shown with long horns. In previous games, they don't have those. Does that mean ESO is going against the lore? No, it's just a different depiction, the lore never specified that trolls don't have long horns. 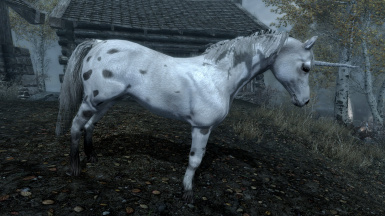 Oblivion's unicorn isn't spotted, its speckled. What I mean is that your attention isn't drawn to them unless you're explicitly looking for it, whereas on your unicorn, they immediately grab your attention and it makes it hard to take the unicorn in (the fact that they're mostly concentrated around the back end doesn't help). Anything originating from ESO should be taken with a grain of salt. Even if Bethesda says its canon, they didn't develop it, and its really unclear how involved they actually were, and how much Zenimax knew about the game lore. 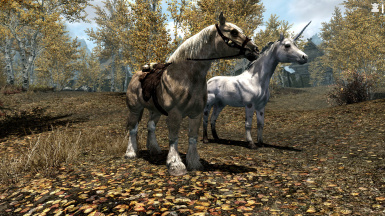 In fact, there are a few noticeable errors in the game, most notably the climate of Cyrodil. SkyLover, this isn't up for debate. If you don't like the design, don't use the mod. 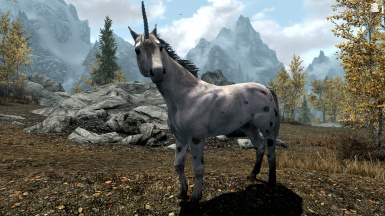 Could you make an all white unicorn please. 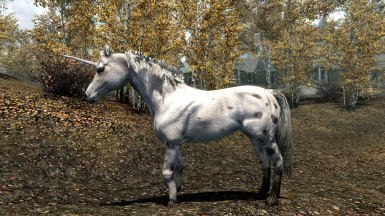 Like how unicorns in lore are supposed to be. I like the black spots adds more detail to the unicorn makes it look more unique. How fast is the unicorn and how long does it stay with the spell? 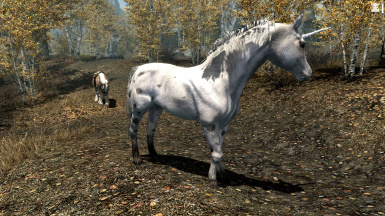 if it has normal horse speed I may use a horse mod to make it faster like immersive horses. Thanks! 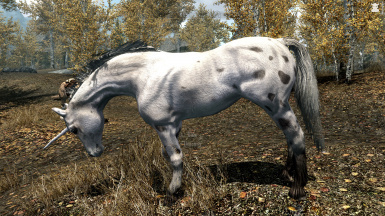 It is faster and has longer endurance than normal horses. It will stay forever if you're riding it, but it will expire once you get off the horse. 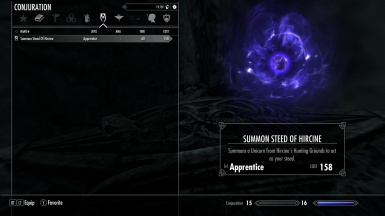 If you don't climb on, it will disappear after 1min (more with conjuration perks).